You hear the voice in your head but you ignore it. Your brain keeps screaming but your heart refuses to listen. It begins as a whisper and increases in intensity with every groundout to second, every injury update, and every zero on the scoreboard. “It’s over,” the voice says. Is it possible the best era in Phillies history is over? I’m not ready to say that just yet, but it’s hard not to look over at the Nationals and be reminded of the 2007 Phillies. The Nationals, like the ‘07 Phils, are a youthful, energetic group with the look of a team on the rise. The 2012 Phillies have the appearance of an old, unmotivated, unenthusiastic team with their best days behind them. Waiting for the triumphant return of Ryan Howard and/or Chase Utley might be too late to salvage the season. Something must change now. So, to rip off a story from Charles Dickens, over the next three articles the Phillies will be visited by the ghosts of Phillies Past, Phillies Present, and Phillies Future. They can help us take a step back and examine where the Phillies were, where they currently stand, and where they are headed. Let's meet our first ghost. Adorning a shirt with the words "Man or Machine?" inscribed on it, the Ghost of Phillies Past gallops in atop a Clydesdale steed and insists we call him “Pat the Bat.” He takes us back nearly five years to September 30, 2006. For the second straight year the Phillies are eliminated within the final two games of the season, missing the playoffs for the 13th straight season and the 22nd time in 23 years. The Phillies were a cursed team in a cursed city. Then something strange happened. Well...in Who-ville they say that the Grinch's small heart grew three sizes that day! The William Penn Curse loosened its grip as the Phillies won the division in 2007 and won the whole thing in 2008. The curse was over and it seemed Cole Hamels was right and they would go down that Broad Street Parade again, and again, and again. It nearly happened, too, as they got all the way to Game 6 of the World Series in 2009. What made those Phillies teams so successful? The Phillies won based on a nucleus of young, homegrown players who were all entering the primes of their careers at the same time but not yet making huge salaries. Ed Wade drafted Jimmy Rollins, Ryan Howard, Chase Utley, Carlos Ruiz, and Cole Hamels, while Pat Gillick picked up Shane Victorino and Jayson Werth as Rule 5 players. It was a perfect storm. In 2008, those seven players made a combined $27.6 million dollars. A group which included six all-stars and two MVP's cost the Phillies an average of $3.9 million dollars each. Think about that for a second. Those same players today make a total of $87.2 million and an average of $12.5 million (and that number will rise when Victorino and Hamels reach free agency). It's easy to see how the Phillies won, as they had a Yankees roster for less than a third of the price. It was a team built around offense, but the Phillies also had a pitching staff that ranked fourth in the league. It included a decent starting staff with Cole Hamels, Brett Myers, Joe Blanton, and Jamie Moyer; and a terrific bullpen with Brad Lidge, Ryan Madson, JC Romero, and Chad Durbin. 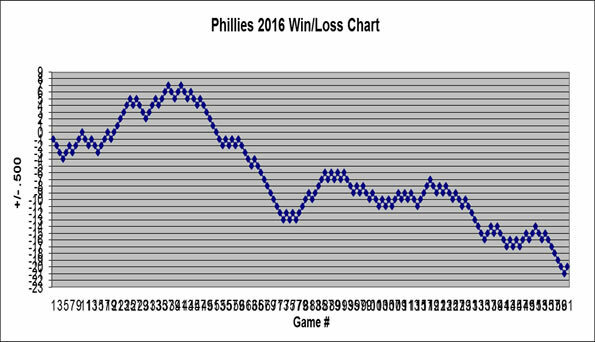 The 2007 - 2009 Phillies were not only built to win now, but they were designed to win in the future. With a significant portion of the Phillies roster unable to test free agency for several years, there was no reason to disrupt the nucleus. Not only that, but the Phillies farm system was full of talent that would soon produce 14 prospects who would be later used to acquire Cliff Lee, Roy Halladay, Roy Oswalt, and Hunter Pence. Young, cheap, homegrown players, solid pitching, and a strong farm system was the formula. The future looked bright. What was in store for them next? The Phillies were no longer sellers at the trading deadline. They were buyers. I’m an old school baseball guy, I’ll admit it. That’s why I thoroughly enjoyed what happened on Sunday in Washington. Sunday night’s game showed exactly how old school baseball is supposed to work and I will explain how. Cole Hamels wanted to send a simple message to Bryce Harper. "It's just welcome to the big leagues," said Hamels. He delivered his message with a fastball square in Harper's back. There are several ways Bryce Harper could have responded to being intentionally hit. 1. Complain about it like his “gutless” GM and demand a suspension. 2. Charge the mound and start a brawl. Bryce Harper chose the last option. Harper took his medicine like a big boy. He gave no dirty looks, took his base, went first to third on a single, and stole home right in front of the guy who just plunked him. No punches, no whining, no bench brawls, and Harper won the battle. Expanding on his “welcome to the big leagues” comment, Hamels continued to say “I think he kind of did that to me,” with that referring to how he schooled Hamels on the base paths. Harper got his personal revenge on Hamels, but the Nationals needed to send a message of their own to the Phillies. The Nats did that the next inning when Jordan Zimmerman hit Hamels while he attempted to bunt. Hamels gave a brief look to Zimmerman, then took his base and it was over. The old school system worked perfectly and it was a beautiful thing. Hamels gave his message, Harper gave his, and the Nationals gave theirs. It’s the way baseball has been played for 100+ years and it works. It all ended there. Nationals GM Mike Rizzo and guys like Curt Schilling decided to make one little pitch from Hamels into World War III. Rizzo called Hamels "fake tough" and said his bean ball was the most "classless, gutless, chicken[bleep] act" in his 30 years of baseball, among other ridiculous comments. They blew this situation WAY out of proportion and there was absolutely no need for it. Bryce Harper and Jordan Zimmerman retaliated appropriately according to baseball code and IT WAS OVER. The players took care of it themselves and MOVED ON until Mom and Dad stepped in. They handled it the way men handle things: you tick me off, we punch each other in the face a few times, then we walk the other way and act like nothing happened the next day. It may seem juvenile, but it's a time tested system that works. The late Tug McGraw once told me a story about a prominent player moving from the American League to the National League who settled into the batter's box to face Bob Gibson for the first time during spring training in St. Petersburg, Fla. According to McGraw, Gibson drilled the player in the back with a first-pitch fastball, walked to home plate, picked up the ball and said, "Welcome to the National League." We hold on tight to our local success stories in Philadelphia. Represent Philly well and fans love you, turn your back on Philly and they destroy you. It’s the reason a statue of a fictitious boxer stood in front of the Philadelphia Art Museum steps, it’s the reason East River Drive was renamed after a movie star, and it’s the reason fans despise JD Drew, Scott Rolen, and Kobe Bryant. It’s also the reason we love John Kincade. John grew up in Philadelphia and now hosts a local sports talk radio show in Atlanta as well as a national radio show. But that's not why we love him. We love John Kincade because he has our back. He may have an Atlanta mailing address, but if you hear him on his radio programs or as a guest on WIP, you know that his allegiance to Philadelphia has not faded in the slightest. It’s not uncommon for radio personalities to succeed in multiple markets, but you won't find many who openly proclaim a rooting interest in not one, but all enemy teams from another city. John developed his rooting interests in his home town of Broomall. He attended Saint Anastasia School, Cardinal O’Hara High School, and Temple University, where he majored in Communications. John “began” his professional broadcasting career as a contributor to the WIP Morning Show from 1992 – 1994 before moving to Atlanta in 1995. John is quick to point out that much of his success is due to the help of several talk show hosts in Philadelphia and jokingly admits he is a crook for stealing bits and pieces from all of them over the years. John considers himself to be a mishmash of all of them. “I would not have a national talk show today without guys like Cataldi, Eskin, and Missanelli." John particularly feels indebted to Angelo Cataldi, who "has been a mentor on so many fronts." What makes him so special to John is that Angelo wants those around him to become stars, even if it means competing with him or relocating to another city. That, along with Angelo's huge success at WIP, is the reason why John has been “studying his career for a long time." I had a chance to catch up with the transplanted Philadelphian and ask for his thoughts on several personal, baseball, and Phillies topics. So, what’s the difference between hosting in Philadelphia and hosting in Atlanta? "The callers are all pretty much the same, they just have a different accent." Moving on to the Phillies, I asked John a few questions about some of the key pieces on the team. We begin with the longest tenured athlete in the city: Jimmy Rollins. With the Phillies tumbling further and further in the standings, one topic will become a bigger and bigger issue with every passing day. That topic is Cole Hamels and his upcoming monstrous contract. John, should the Phillies re-sign Hamels? John is so emphatic about re-signing Hamels that he has a radical idea on how to retain Hamels AND Victorino, but you’ll have to wait for a future article to hear that one. Halladay's velocity is slightly down, he nearly overheated in a game, we watched in disbelief as Halladay blew a six run lead against the Braves, and he left that same game with personal issues. Asked if he is worried about Roy Halladay, John's response was simply, "No." Now we reach the two most important questions. Will the Phillies win the division? Will they win the whole thing? The time has come to move Jimmy Rollins down in the lineup. Rollins is statistically the second best defensive shortstop in Major League history, he is the longest tenured athlete in Philadelphia, his leadership helped bring five straight division championships, and he was instrumental in winning the 2008 World Series. That’s nice. Now move Jimmy Rollins down to the bottom of the lineup. I’ve heard enough of the Jimmy Rollins is a sparkplug jibber jabber. J-Roll cannot be a sparkplug when he is hitting .225, he just can’t. He isn’t getting hits, he doesn’t walk, he has no power, and now has just above average speed, so he needs to leave the top of the lineup and he needs to leave fast. Yeah, I know, if Charlie moves Jimmy down in the lineup he is going to mope and hurt the team more. Is that even possible? Rollins can’t possibly hurt us more than he is right now with a .273 on base percentage in the leadoff spot. If Jimmy wants to mope, so be it. Freddy Galvis, a clear offensive liability and a player who everyone on the Phillies staff will admit is not ready to hit in the Major Leagues, is hitting better than Jimmy Rollins. Charlie can’t afford to continue inserting an automatic out at the top of the lineup card. Juan Pierre makes the decision much easier for Charlie Manuel. Pierre has been hitting well and is better suited to the top spot, so move him to the top spot for the time being. If Jimmy is any bit the leader he professes to be, he would contentedly acquiesce to the move as an opporunity to get his stroke back. It doesn't have to be a permanent move, but that is up to Jimmy. If he wants to pout, the Phillies have an equally effective replacement in Freddy Galvis who might be better defensively than Rollins at this stage. Charlie would probably never let that happen, but maybe the threat of Galvis is enough to push Rollins to improve his game. Jimmy, be a leader and show everyone that you are willing to do whatever it takes to help the team win. Urrgghh! It’s a moment where throwing an object through your television, banging your head against the wall, and pulling out your hair are all enticing options. That moment occurred with no outs in the sixth inning last night when Polanco remained standing on the third base bag. Polanco was the recipient of a quite a few expletives in my living room and I'm sure I was not alone. Polanco not scoring on Pence’s fly ball in the sixth inning is INEXCUSABLE. Sorry, but there is no excuse for not scoring on that play. For those of you who didn't see it, the Phillies had runners at second and third when Pence hit a fly ball to center field in which Ankiel made a diving catch. That hit scores a run 99 out of 100 times, but this was that one other time. There is ABSOLUTELY NO REASON he shouldn’t score on that play. As soon as ball hits bat, Polanco’s first movement MUST be towards third base. If the ball drops, he scores. If the ball is caught, he tags and still scores. Not one single outcome should involve continuing his conversation with Juan Samuel for one more at-bat. The frightening aspect is that amidst their obvious struggles knocking in runners in scoring position with less than two outs, how on earth is Polanco’s first thought not to tag? When Polly’s head isn’t in the game, the Phillies are in big trouble. And the problem does not begin and end with Placido Polanco. Ohhh, far from it. Polanco’s lack of focus is symptomatic of a team that is not ready to play and certainly not ready to win another World Series. How hard is it to hit a ground ball to second base? A fly ball to center field? To tag up on a sac fly? To not run when an infield fly pop up is dropped? Those are just a few of the mishaps we have seen in the last couple of weeks. "I think we don't have the big bats like Chase and Howard, so it's important, but even if we did have them, it's still important," third baseman Placido Polanco said. With the Phillies dominant starting staff, those one or two runs they have been leaving on the base paths will be enough to win a lot of ball games. Charlie is not asking for three run home runs, two run doubles, or even two out hits in many cases. All he needs is some weak grounders to short and routine fly balls. But that has not happened 63% of the time. It comes down to what Charlie mentioned. "If you're going to scream small ball or little ball," Manuel said, "we have to score those kinds of runs." The Phillies are not scoring those runs, they are in last place, and if they keep it up that's where they might finish. OK? Freddy Galvis, the next Larry Bowa? Quite rare is the opportunity to witness greatness before it is great. Jimmy Hendrix’ first guitar, Paul Newman’s first script reading, Jordan’s first dunk, Tiger’s first swing, Gretzy’s first shot. How about...Freddy Galvis’ first at-bat? Putting Freddy Galvis in the company of the all-time greats might be stretching it, but I get the feeling that Freddy Galvis is one of those “yeah, I remember when" players. The kind of player fathers point out to sons and grandfathers brag about to grandsons. You wouldn't know it by looking at him, standing at 5'10", 170 lbs. and you certainly wouldn't know it by examining his minor league stats, but that didn’t seem to get in the way of a former Phillies shortstop named Larry Bowa. "Exceptional fielder at second. Fair arm. Coming as a hitter. Can step in right now and do big league job." Those are one scout’s comments about Larry Bowa and can easily be applied to Galvis. Bowa turned his 5'6", 155 lb. frame into a 16 year career and the third best fielding percentage in baseball history. With four inches and 15 pounds on Bowa already, why can't Galvis do the same? Prior to last season, Freddy Galvis was a .233 career hitter in four minor league seasons. Taken another way, out of 1,589 times at the plate, Galvis still only managed a .233 batting average. It was only until last season that Freddy gave any indication he could hit in the big leagues when he finished with a .278 average in double and triple A, which is decent but not exactly Ty Cobb territory. Here is where we find the big difference between Martinez and Galvis: At 22, Freddy Galvis is seven years younger than Martinez. Ruben Amaro readily admitted Galvis was not ready to hit in the majors, putting Galvis in the difficult position of learning how to hit in the major leagues. Galvis showed just how difficult it can be when he went hitless in his first 12 at-bats. He was pulling off, whiffing badly at breaking pitches, and showing little patience at the plate. Galvis was becoming a punch line. He hung in there, though, and eventually started to improve. Since his 0-for-12 start, Galvis is hitting .254 for a .236 average overall. More importantly, he has been productive and ranks 4th on the Phillies in RBIs (23) and extra base hits (17), 1st in doubles (13), and even 5th in homers (3). Numbers are nice, but it's his natural baseball instincts that separates Galvis from the pack. They say you can't teach talent, but instincts aren't exactly easy to learn. Defensively, Galvis has both. Good range, soft hands, and a strong arm makes Galvis a natural middle infielder. Galvis made the transition to second base look easy due to his inherent understanding of the game. Whether it be at second or short, his fundamentals on double-plays, relays, and plays at the plate are flawless. But it's the little instinctive things he does which are most impressive. A perfect example was on a play he made on a grounder in which first base was unoccupied and he bolted to first to get a big force out. Very few veteran players have the awareness to make such a play. His instincts are not exclusive to his defense, as Galvis routinely takes extra bases, makes solid contact, and his 13 doubles indicate a real knack for hitting the gaps. Whitey used to say, "Don't let the facts get in the way of a good story," and I want to believe the stats don't tell the story of Freddy Galvis at this point in his young career. Galvis has a maturity beyond his years and the requisite tools, skills, and instincts to be a success in the major leagues. Is he the next Larry Bowa or the next Michael Martinez? Only time will tell. It’s not very often you see a team utilize a defensive shift on a leadoff hitter, but that’s exactly what the Mets did last night with Jimmy Rollins. Yes, a shift…for Jimmy Rollins. He should feel embarrassed and ashamed that the Mets would even consider such a notion because any true leadoff hitter should NEVER see a shift. The Mets’ decision to put on the shift speaks volumes about Jimmy's ability to leadoff. Jimmy Rollins has always been a leadoff hitter, demands to be a leadoff hitter, yet he has never acted like one. The job of a leadoff hitter is to reach base, utilize his speed, and allow the sluggers to drive him in. Yet J-Roll would rather pretend to be a home run hitter. If you got a nickel for every time Rollins swung for the fences and popped out or struck out on a high fastball when all the Phillies needed was a base runner or a base hit, you might actually be able to afford taking a family of four to Citizens Bank Park. It’s one of the many reasons I never, ever, liked Rollins in the leadoff spot. Leadoff hitters should be able to hit for a high average, take walks, and lay down bunts. Jimmy does none of those things and in most cases refuses to do them. I’m convinced Rollins could be a .300 hitter if he wanted to be. But no, Jimmy wants to be a poor man’s Ryan Howard. That’s why it comes as no huge surprise to see the Mets employ the shift, as his disregard for his own skill set and his infatuation with the long ball renders him a dead pull hitter. With no opposite field power, it’s the only way he can put one in the seats. It makes sense for the Mets in a way because they were just playing the odds. What should infuriate Rollins is the fact that the Mets had no faith he could hit the ball the other way or, God forbid, lay down a bunt. If that isn’t the biggest slap in the face for a leadoff hitter, I don’t know what is. A leadoff hitter with no bat control? A leadoff hitter that can’t bunt? Rollins should have been fuming. And it appears he was, as Jimmy slapped two base hits right through the hole of the shift and into left field. It proves that Rollins does not lack the ability to place hits. Which brings us to the Mets' perplexing decision to use the shift in the first place. It makes perfect sense with power hitters like Howard. If Howard decides to beat the shift by tapping a ball to the vacated area, it eliminates the possibility of a long ball. He won't hit a home run. Teams would happily make that trade with Howard, but that is not, or at least should not be the case with Rollins. All the shift does is give a free hit to a .230 hitter. Jimmy was making outs quite successfully on his own, so why mess with a good thing? My hope is this is the wake up call Jimmy needed to finally realize his place on this team and become the leadoff hitter he should be. Of course, his three-run bomb later in the game probably erased the shift from his memory already. So don't count on Jimmy changing his ways. If he hasn’t done it in his 13 seasons in a Phillies uniform, why would he start now?